Angelina Jolie is basking in a standing ovation at Telluride after the first screening of “First They Killed My Father.” It’s the film she wanted to make: Based on the 2000 memoir of Loung Ung, who was five when the Khmer Rouge forced her family into work camps, it required a $24 million budget, a 60-day shoot, a two-hour, 16-minute cut. The only place she pitched the film is the only one who would let her make it: Netflix. 1. The movie chooses truth over gloss. Ung was 30 when she began talking to family members in Cambodia and researching “First They Killed My Father: A Daughter of Cambodia Remembers.” And 17 years ago, when Jolie visited Cambodia for the first time to shoot “Lara Croft: Tomb Raider,” she read Ung’s memoir and looked her up, sharing her desire to adopt a Cambodian child — who turned out to be her son Maddox. They have been close friends ever since. 2. A young girl’s realistic and very uncomfortable perspective tells the story. Jolie slowly takes us through each transition, showing it all from the perspective of wide-eyed young Loung Ung, who learns what it means to be unsafe and abused and starving. Along the way, she loses family members and trains to become a child soldier. And she is eventually separated from both of her parents and all but one sibling. Agile Oscar-winning “Slumdog Millionaire” cinematographer Anthony Dod Mantle’s cameras take us close to Ung as she experiences what is going on around her. You see the flora and fauna, the beauty of nature, flowers and insects. On set, leeches were so commonplace in water scenes that everyone just flicked them off. And that’s a real giant fuzzy tarantula. 3. It’s a Cambodian movie. Also joining Jolie, who has been a Cambodian citizen for a decade, was Cambodian filmmaker and producer Rithy Panh, who directed foreign-language Oscar nominee “The Missing Picture.” His Rithy Bophana Prods. hired and supervised more than 500 Cambodian craftspeople and technicians, many of whom, like him, were survivors or children of survivors of the genocide. The film recruited more than 3,500 Cambodian background actors. Ironically, given his history under the Khmer Rouge, Pan helped organize the Khmer Rouge soldiers on set. And Ung’s role was “taking care of everybody,” said Jolie, who juggled large battle sequences, stuntmen, explosions, and thousands of extras. “I was making sure everyone was safe first and foremost, for sure,” she said. 4. The sound design is delicate, the soundtrack minimal. 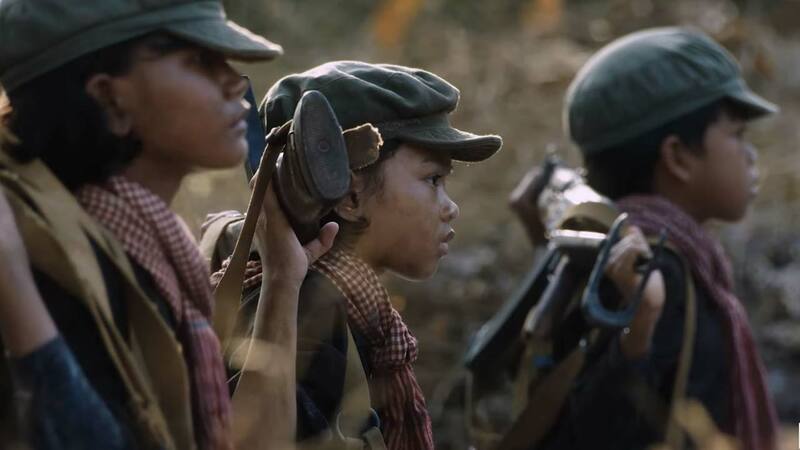 “First They Killed My Father” premiered on Netflix September 15, and is currently in limited iPic theaters for a one-week day-and-date run.